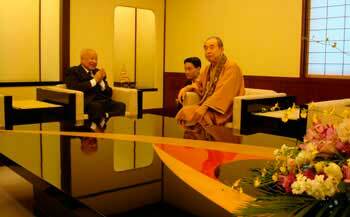 Kato, Japan -- Ambassador Julio Jeldres accompanied Cambodia's King Father Norodom Sihanouk to the Fifth Buddhist Summit, held in Kato City, Hyogo prefecture, on Japan's Honshu Island . King Father Norodom Sihanouk and Queen Mother Monique with His Holiness the Most Venerable Dr Kyuse Enshinjoh. FROM October 29 to November 4 last year, His Majesty the King Father Norodom Sihanouk of Cambodia, accompanied by Queen Mother Norodom Monineath and a small delegation, visited Japan as guests of the Founder Priest of the Nenbutsushu Buddhist Sect, His Holiness the Most Venerable Dr Kyuse Enshinjoh, the current president of the Buddhist Summit. Their Majesties were the Chief Guests of Honour at the Fifth Buddhist Summit, held in Kato City, Hyogo Prefecture, on Japan's Honshu Island. I was privileged to be invited by Their Majesties the King Father and Queen Mother on this trip, and I would like to share this brief report with the readers of The Phnom Penh Post. Buddhism spread gradually eastward from India through China to the country known then as Yamato, the land of great harmony and the terminal point of the Silk Road: Today's Japan. It is said that Chinese Buddhist monks risked their lives in small watercrafts and sailed over raging waters to bring Buddhism to Japan where it eventually flourished. As Chief Guest of Honour, King Father Sihanouk officiated over the opening ceremony of the Royal Grand Hall of Buddhism, presided over the inauguration of the ‘International Buddhist Conference Hall in honour of HM King Norodom Sihanouk of Cambodia' and addressed the opening of the Fifth Buddhist Summit. It surely makes up the most significant collection of temples in the world. The Royal Grand Hall of Buddhism is now recognised as the largest Buddhist structure in the world and was born out of the vision of His Holiness Dr Kyuse Enshinjoh, 82, the Founder Priest of the Nenbutsushu Buddhist Sect, one of the most influential of the sixty Buddhist sects in Japan. Many years ago during a trip to India Dr Enshinjoh was saddened by the dilapidated state of the Buddhist holy places he visited. They were thickly covered with overgrown grass, barren lands consisting of nothing except rubble. Temples and gardens outside the Royal Grand Hall of Buddhism in Japan - where King Father Norodom Sihanouk was for a visit late last year. He decided that Buddhists should have an appropriate place of worship just as Christians have the Vatican and Muslims have Mecca. Dr Enshinjoh underwent a difficult series of trials and tribulations ahead of the construction of this grand Buddhist temple. Potential locations were considered but rejected one after the other. Finally, after many years of effort, accompanied by the disappointment of two failures along the way, His Holiness came across the site known in local Japanese legend as "Mamushi-dani" or the "Valley of Vipers." It is said that the valley was inhabited by a large number of poisonous snakes which kept people away. Dr Enshinjoh said he had a dream one night in which he found himself surrounded by vipers and that a particularly imposing king snake had told him that they had been waiting for him to come and use the land, assuring him that they would protect it at all times. The site, nestled in an imposing valley near the city of Kato about one and a half hours drive from the port city of Kobe and surrounded by high mountains, is a place of stunning natural scenery. Its beautifully kept gardens looked simply superb and splendidly tranquil in the Japanese autumn. The Royal Grand Hall of Buddhism is a superb building in traditional Japanese style and surely ranks among the most significant and magnificent collection of temple buildings in the world. In accordance with the ancient style, it is composed of a main pagoda, multiple halls and a huge guesthouse. It took seven years to complete and it is estimated that some 3.5 million architects, engineers, skilled craftsmen and workers from China, Japan and South Korea were involved in its construction at a cost of about 60 billion Japanese yen (US$662 million). Some of the features of the Royal Grand Hall of Buddhism include exquisite carvings, colouring in the best ancient traditions of the North Asian region, as well as Buddhist images presented by kings, heads of state and government from attendant countries. 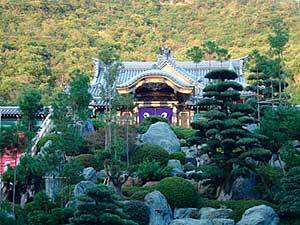 Sources from the Nenbutsushu Buddhist sect told us that such a grand-scale Buddhist complex has never been built in the contemporary history of Japan, since the construction of the Obakushu main temple in the city of Kyoto, some 350 years ago. Royalty from Bhutan, Cambodia, Thailand and Toro (Uganda) as well as the Sri Lanka's Prime Minister Ratnasiri Wickremanayake and political leaders and ambassadors from 32 countries attended the inauguration ceremony whose highlight was the 800-metre march of the monks from the main gate of the temple up a flight of 300 steps leading to the Royal Grand Hall of Buddhism. After the foreign monks and visitors had taken their seats, the sect's monks, donned in mustard-coloured robes, made their entrance and proceeded with their ancient ritual lasting one and a half hours. King Father Sihanouk said in his speech to the gathered Buddhists that he "felt truly honoured and grateful to our Lord Buddha for allowing me to live long enough to be able to visit this holy place". Dr Kyuse Enshinjoh and the leadership of the Nenbutsushu Buddhist Sect of Japan said that they hope the Royal Grand Hall of Buddhism will become the main spiritual base for the world's 370 million Budhhists. Julio A Jeldres was appointed roving ambassador to the King Father in 1993 and is the official biographer of HM King Father Norodom Sihanouk of Cambodia and research fellow at the Asia Institute of Monash University in Melbourne.